A flower’s delicacy, color, texture smell and shape generate in me, as in many of us, feelings of wonder, awe, connectedness, elation and even spirituality. That is the major reason that I photograph flowers so much. The more distinct and sharp the details of the image, or at least of the area of primary importance, the more effective it is in rekindling the emotions we were experiencing when we took them. A brilliant, sharp enlargement of a dahlia or hibiscus (or myriad of other flowers) hanging on the wall can quickly lift my spirits. One of the most common photographic issues that people have is a lack of sharpness. Sharpness (along with color and composition) is a major determinant of the viewer’s perception of an image as “reality”. To help with this I put together a list of recommendations for maximizing photographic sharpness. Please don’t let the length of this list be intimidating. Adding proper handheld technique, a tripod and just one additional item from this list, will greatly improve the sharpness of most photographer’s images. Lens sharpness: An image can be no sharper than the lens’s maximal capability. Lenses that come with a camera are usually not particularly sharp. The more expensive the lens, the greater its sharpness. Companies usually have at least 3 levels of lens quality and sharpness. Inexpensive lenses have inadequate sharpness. The most expensive lenses are beyond the financially capacity of many of us. The mid-level is usually a good balance between quality and affordability. Macro lenses: some lenses, called macro lenses, are designed exclusively for close-up and macro work. For this they provide excellent sharpness. However, they will not provide adequate focus at a distance. They are just not designed for that. Clean lens surface: Substances on the surface of a lens (fingerprints, smudge, droplets) obviously scatter some light, producing blurry areas of a photo. Obviously cleaning these off will improve the sharpness of your images. However, I am frequently surprised by the amount of fine powdery dirt, sea breeze haze or smog grime that is on my cleaning cloth when the lens surface appears to be clean to begin with. Therefore frequent lens surface cleaning is recommended. However, lens cleaning needs to be done carefully to avoid scratching the lens itself.This is best done by first blowing off debris with an air bulb or canned air (Don’t blow on the lens. That will leave lots of tiny droplets of saliva which further impair a lens’s sharpness). Second, use a lens cleaner made for your specific type of lens and , either lens tissue, or clean microfiber cloth. It’s important for everything that is used to clean the lens be very clean itself. The camera sensor: An image’s sharpness is limited by the sensor’s capabilities. Sharpness is dependent on pixel size and number, efficiency of tiny lenses over the top of the pixels and quality of in camera processing of data. Some independent labs, such as dpreview.com, provide trust-able information about specific cameras. A sensor does not have to be large to be very sharp. Some smaller cameras have excellent sensors. However, essentially all current generation DSLR’s provide excellent sharpness. It’s important to note that sharpness decreases as enlargement size increases. If you want only 4 inch by 6 inch prints, essentially any digital camera, except for phones cameras and web cams, can give excellent results. The most common cause of unsharp (soft) images is motion of the camera while the shutter is open. This is called “camera shake”. It is common when the camera is being hand-held. An imperceptible movement of the hand while the shutter is open is all that it takes to blur a photo. Here are some ways to eliminate camera movement. 1) A hand-held camera technique that a lot of pros use is to take in a breath, let it out slowly and at the end of the exhalation, squeeze (don’t jerk) down on the shutter release button. 3) When using a tripod, also use a shutter release cord or remote control so that you are not touching the camera when the shutter is open. 4) When using a tripod, also use the mirror lock-up option (DSLR’s only). DSLR cameras have a mirror that slaps up to the top of the camera internally immediately before the shutter opens. This causes an internal vibration which can slightly blur your images, particularly during close-up and macro work. This “mirror slap” is remedied by operating in “mirror lock-up” mode and using a cable shutter release or remote control. Mirror lock-up is a setting that is usually hidden in the menu of custom functions. I suggest checking your camera’s instruction manual to find it. (Not all DSLR’s offer the “mirror lock-up” mode.) When this option is activated, the first press of the shutter release cable raises the mirror up and away from the sensor. The mirror stays up until your second press of the shutter release, which activates the shutter. If there is a pause of 3 seconds between raising the mirror and opening the shutter, usually both the internal vibration and any tripod or lens vibration, from having touched the focusing rail or camera, will also be avoided. Camera’s with full size (35mm) sensors, heavy camera/lens combinations or economy tripods may need a longer delay. (luxborealis recommends a 5 second delay between mirror-up and shutter release in order to accommodate all camera/lens/tripod combinations. The vast majority of my work is done with tripod, mirror lock-up and cable shutter release. 6) Another effective approach for sharper images is shortening the amount of time that the shutter is open. Most cameras have a shooting mode called “sports” or “action”. In this mode, the camera will try to pick a shutter speed of about 1/250 sec. in order to “freeze” the motion of a moving subject. The camera then adjusts the aperture size and ISO speed to get a correct exposure. It is usually very effective, even without bright light. This program or shooting mode is usually indicated by a tiny picture of a sports figure on the program/shooting mode wheel or menu. Cameras without a specific sports/action program, often have an option in the shooting menu called “sharper” or “more sharp”. This has a similar, although usually not as strong, effect as a sports program/mode. Another way to create a fast shutter speed is to use the “shutter priority” program/mode. This allows you to set the shutter speed and ISO manually. Then the camera chooses the appropriate aperture. Shutter priority works well when your subject is in bright light. But there’s a large limitation. In low light, the camera may choose a large enough aperture that the background and foreground are blurred even though the subject is in focus. If you want sharp subject, background and foreground in dim light, increase the ISO until you get an aperture of f/11. What shutter speed to choose? If the subject is stationary and your hand-holding technique is good, a shutter speed or 1/60 sec or higher works well. If you are using an image stabilization option, the shutter speed could go slower by 1-2 stops. A person walking will generally be sharp at a shutter speed of 1/125 sec or higher. A person running will be sharp with a shutter speed of 1/250 sec or higher. With most image stabilization options, you can go 2-3 stops slower with excellent result. However, when in the “sport” or “action” mode, your camera will make the ISO adjustment for you. Here are some camera settings that help to increase sharpness. They are usually in a shooting/recording menu. File size/resolution: Choose the largest numbers that your camera offers. File format or file type. There are three file types/formats of which to be aware. The first is jpg (pronounced jay-peg). Most cameras offer this option. When using this format, the shooting/recording menu usually offers at least 3 levels of sharpness. Choose the highest level for maximal sharpness. The major drawback to jpg files is that they lose a little detail and sharpness each time the file is opened. The remedy is to change your jpg files to a tiff file format as soon as the images are in your computer. Tiff files do not lose any data when opened repeatedly. The third file format of importance is called a “raw” file, although it is not available in all cameras. “Raw” means that the recorded information is not processed within your camera (as are jpg files). Canon calls their raw file CR2. Nikon calls theirs NEF. Other companies have their own initials. Raw files are analogous to the photographic negative from film days. Any changes that are made to a raw file with editing software, can be erased, giving you back the original image. Raw files are inherently not very sharp. However, excellent sharpness is achieved by processing them in your computer with editing software that allows you to add sharpness to it. This can be done either with the software that came with your camera or with the “raw converter” in Photoshop, Photoshop Elements or an equivalent. If you have Photoshop Elements’ Raw Converter and do not know how much sharpening to add, try sharpening amount 40, radius 1 and detail 60. At the same time, you can decrease noise which acts like haze. You might try (for Photoshop Elements Raw Converter) luminance noise reduction of 40 and color noise reduction of 20. These settings will probable not overdo it. But the nice thing is that your original image information is always there to adjust differently if you wish to. I hope that this will be useful information for someone. In my next blog post I will go over additional ways to get sharp images. Comments, suggestions and even criticisms are welcome. I am available at NaturePhotoRehab.com assisting clients to transform their nature images into works of art that they will be proud to either hang on their own wall or give as a gift. 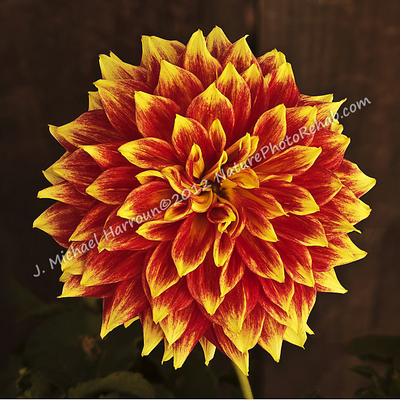 I offer photo retouching, complex processing and enhancements, enlargements, prints up to 12in x 18in and framing. One limitation of film photography is that only a portion of the subject or scene is precisely in focus. One of the marvels of digital photography is its ability to allow portions of multiple images to composite into a final image that is more fully in focus and more life-like. Expanded depth of focus is such a technique. After taking multiple similar images with the depth of focus being the only variable, only the precisely focused portions of each photo are combined into a final image in which everything, or at least as much as is wanted, is crisply in focus. My blog post from July 16 is an introduction to this technique. Here, I describe the some of the attitudes and states of mind that I have found highly effective for happiness and success with this type of photography. I welcome others comments, suggestions and additional thoughts. Appreciating the moment is, for me, the key to happiness with all of my photography. I usually hurry around oblivious to the details of the miraculous nature around me. Photography not only allows, but requires, me to slow down and pay attention to the details of my surroundings. The more aware I am of the sun, breeze, colors, textures, shapes, sounds and smells around me, the more I feel alive and connected to the magic that is nature. Having achieved that feeling of fulfillment, getting usable results from my shoot is just like the sprinkles on the frosting of the cake. I’m serious about this. 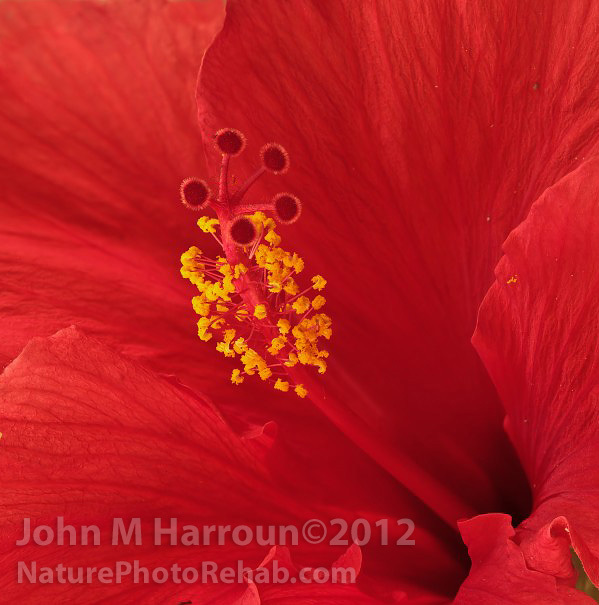 One day I spent 2 ½ hours shooting multiple series of freshly cut hibiscus. I realized that I may not have waited long enough for the pistils and stamens to have fully regained their original shape. I knew that any further change of shape during the shooting of each series would produce enough change of position on the sensor to render it unusable for a composite. However, I was feeling alive and connected to my surroundings. I ended up throwing out 150 frames, having only the last series usable. But I truly felt only happiness and satisfaction regarding my morning’s shooting experience. The two goals: When I begin each shoot, I have only two goals in mind. The first is not to damage any of my equipment. The second is to be alert and aware of the incredible intricacy that is nature. Mountain climber’s deliberateness: When moving around the camera, tripod, focusing rail and lens, it is easy to bump one of these. This is particularly likely when unlocking, adjusting and relocking the focusing rail or when leaning forward-looking for small movement of the subject due to wind. It is easy to bump some part of the equipment. A light bump may move the tripod imperceptibly, but enough to change the position of your subject on the sensor, making the remainder of the series unusable. Also, when manipulating the focusing rail, I often simultaneously support the camera with my other hand, particularly when the focusing rail is extended or when the camera is in a vertical position. If I touch the lens’s focusing ring/collar even lightly, the focus of the remainder of the series is likely to be way off. To avoid trouble, movements must be thoughtful and deliberate. I have a picture in my mind of a mountain or rock climber, half way up a steep granite cliff. On a single outing, the climber makes thousands of decisions regarding hand or foot placement or weight shifts. It takes only one mistake out of the thousands of decisions to produce a slip, a slide or even a serious fall. The climber must be continually alert, thoughtful and deliberate in order to succeed. Similarly, it takes only one large mistake out of hundreds of decisions to render a set of images unusable for a successful composite. (Luckily, however, few people have sustained serious injury as a result of a mistake while shooting images for expanded depth of focus.) I call this mountain climbers deliberateness. It has decreased my errors greatly. Patience is crucial, particularly for outdoor shooting. It’s possible for the smallest movement of air to move some part of a. This can also occur indoors due to air circulation and ventilation ducts. If I’m impatient and accept frames that might have movement, I usually end up without enough good frames for a good composite. I must be willing to wait until I’m certain that there is no movement of the subject or anything touching any portion of the support of the subject. Here I am referring to movement of a nearby flower, leaf or stem which is in contact with my flower, its leaf or stem. This can mean, at times, taking 35 min to shoot 45 frames. If I take of shot that I think might have had movement, I delete that frame and . It’s not worth the risk of sacrificing the whole series. Hurrying usually wastes my time. Although I get quicker results, often these results are unusable for successful composites. Start small and gradually enlarge your subject. I started with and recommend using smallish subjects initially. For instance, a pansy, rose bud or small geranium is going to be less complicated and, initially, more likely to succeed than a large iris or rhododendron. Start too close and end to deep. In order not to accidentally miss the point of closest focus, I recommend starting with an initial frame which has its focus 1-3 focal increments closer to you than the subject.Although not as important to the success of the composite, I also recommend going deeper than the deepest area of focus that you want. It’s always better to take some unnecessary shots, than to come away with 90% of a great series. Since you are there and all set up, this takes only a little time. I consider it cheap insurance. 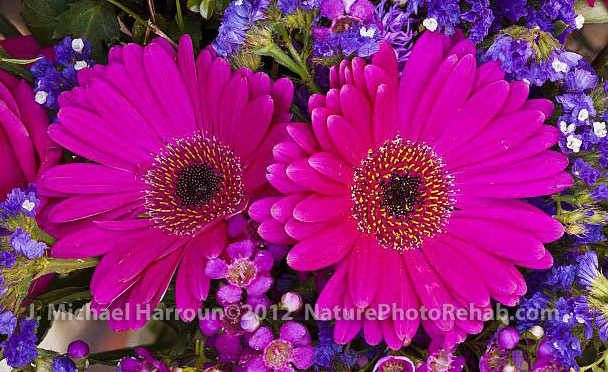 My website for nature image retouching, processing, enlargements and framing is NaturePhotoRehab.com. I specialize in transforming people’s dull and listless images into dramatic works of art that a person is proud to hang on their wall or give as a gift. I hope that some of this has been useful to someone. I welcome individual comments and questions. This is the second in a series of blogs about the photographic technique called expanded depth of focus. For this, multiple digital photos are taken of the same subject, all identical expect for the area of sharp focus. Then, by computer processing,all the different areas of crisp focus are combined into a single image which is entirely in focus. This allows images to appear more life-like. It is one of the marvals of digital photography that cannot be duplicated with film images. If you are unfamiliar with this photographic technique, but somewhat interested, please check out my blog post from July 16, which is an introduction to the topic. If you are knowledgeable about this topic, but have no interest in trouble shooting yet, please go to my next post entitled “Philosophy”. Being aware: Fully 95% of my unusable series are due to an error of mine that I did not recognize at the time. I overlooked a problem that, if recognized, could have been corrected at the time it occurred. I know this, because as I get more experience and become more aware, I get a much greater percentage of excellent results. used a camera with enough megapixels and file size and file format to give sharp focus for the amount of enlargement required for your computer screen and your planned print size. utilized a lossless file format. Raw images are best. used small enough increments between focal planes that the areas of sharp focus overlap. This is critically important, because areas of focus must overlap. Thus the increment of advancement of the focusing rail between frames would be, at most, 1/3 of the lens’s depth for that distance from the subject. Specificly, if a macro lens is 10 inches from the subject, the depth of sharp focus may be only 3 millimeters (about 1/8 inch) deep. Therefore the increment of advancement of the focusing rail will need to be no greater than 1 millimeter (1/24 inch). However when 3 feet from the subject, this same lens may exhibit a depth of field of 48 mm (2 inches). In this case the correct increment would be, at most, 16mm (0.7 in). To determine your lens’s characterist, take an image of a ruler end on. Take images at the lens’s closest focal distance, then double the distance and double it again. The measurements do not need to be precise. On your computer, evaluate how many sixteenths of an inch are in crisp focus. one third of that distance is the largerst increment between frames that will give good results. been meticulous to avoid any movement of the subject by air movement or change in the shape of the flower due to heat change. Trouble shooting is an expansive topic. Here I will cover only some of the more sneaky problems. Tripod feet can settle into soft ground or leaves, changing the camera position. If tripod was bumped, it may not have returned exactly to its original position. If all of the tripod leg locks/collars was not fully tightened. A leg can shorten, changing the camera position. If the tripod legs were not splayed all the way to their stop, they can spread causing a change in camera position. This is most often a problem when shooting from a low enough angle that the legs needed to be spread wider than usual.If your camera position is low enough to the ground, the center post can touch the ground, allowing the tripod to rock. If the camera is not fully tightened to the focusing rail, it can slightly twist/torque. This is most likely when shooting in a vertical orientation. That happened to me this morning. I noticed & corrected before any harm had occurred. Tripod head and focusing rail. If the aperture was more than 1 stop away from f/8, the sharpness will be less than the camera /lens is capable of producing. For most lenses, f/8 usually provides the best combination of sharpness & depth of focus. I know that landscape depth of field is considered best at f/16 or a smaller diameter. This does not apply here. I will go into detail about this in 2-3 more blogs from now entitled “Aperture”. 1) Viewfinder of a DSLR camera, if not covered/capped, will let in light that changes the exposure. This is particularly a problem when direct sunlight falls on the viewfinder. File size too small. In the shooting menu, set file size to the biggest numbers that is offered. Too little data or date loss. This is a problem with jpg images. Shooting in RAW format is recommended for many reasons. Stray light: There may have been bright light impinging upon the lens at a sharp angle. A lens hood prevents most of this. Check with the company that made your lens for the specific one to use. Some cannot be used for macro work because they cast a shadow upon your subject. A polarizing filter is highly recommended when shooting outdoors and when shooting shiny, wet or alive objects indoors. Besides enhancing colors and decreasing reflections, it usually blocks stray light and can take the place of a lens hood. However, I shoot outdoors with reflectors producing very bright light impinging upon the surface of the polarizing filter from multiple directions. For these conditions, I think that a lens hood and a polarizing filter give the best results. Besides enhancing colors and decreasing reflections, it often can take the place of a lens hood. However, I shoot outdoors with reflectors producing bright light coming from many directions. I find that a lens hood and a polarizing filter seem to give the best results. Lens distortion is particularly a problem when your subject enlarged or “bloomed” out near the edge of the frame. That presents bizarre data from this area to your stacking software. However, the central portion of the frames will probably give good results. Some editing software can remove lens distortion. I have experience only with Canon’s Digital Photo Professional software. It will remove the distortion of some Canon lenses, but it’s time consuming and this does not guarantee that it will give good stacking results. Focusing ring/collar was touched when reaching for the camera or focusing rail. This can happen even when there’s no noticeable movement of the focusing collar. I have to be careful about this because I steady the camera with my left hand while changing the position of the focusing rail with my right hand. Change of support structure: If a flower is getting even the slightest support from one of its petals or leaves (or a petal, leaf or stem of an adjacent flower) any subtle change of its shape can allow a shift in your subject’s position. This is more likely if there is an intermittent breeze or if I potted plant has recently been moved. Similarly, if a petal, leaf or stem of your subject flower is in contact with petal, leaf or stem of an adjacent flower, then any movement from a breeze can move your subject flower. If there are lots of leaves touching, movement of any portion of the plant can move your subject. To prevent this, wait until there is no movement of any part of the entire plant before shooting. The more complex the interactions among the plant parts and the stronger the wind, the more likely it is that your subject will not return fully to its original position. Although this is true, I shoot outdoors all the time and find this problem to be rare unless the intermittent wind is quite strong. Flowers frequently change shape during a shoot if they were freshly cut or if they were recently moved from shade to direct sun or vice versa. I find this less of a problem if a cut flower has only the bottom ½ inch of the stem in the water. Because there are so many possible problems, I recommend shooting two series of everything when beginning to get experience with this technique. Start the set up for the second series of images from the very beginning, just as though it was the first series. I hope this has been useful information for someone. You are welcome to ask me about particular issues that you would like help with. This is my second blog post regarding the expanded depth of field/focus photographic technique. If you are unfamiliar with this technique, please check out my post from July 16, 2012 entitled Expanded depth of field / focus stacking: Introduction. This current installment is an brief overview of the subject, essentially providing a “Table of Contents” for the remainder of this series. Attitude: If I’m irritable or angry, I usually made mistakes that worsen my mood. Some days it’s better to just do the laundry. Mountain climber’s state of mind: I try to maintain an attitude that I call the mountain climber’s state of mind. A mountain or rock climber might make one or two thousand decisions regarding placement of the hands and feet and shifts of weight during a climb. It takes only one mistake out of the thousands to produce a slip, a slide or even a fall that can ruin that entire climbing experience. Similarly, it takes only one mistake out of hundreds of decisions to render a set of images unusable for a successful composite. Remembering the mountain climber causes me to work very deliberately, move a little slower than usual and maintain awareness of the moment. This produces far fewer mistakes and many more inspiring results than I used to get. Luckily, however, few people have sustained serious injury as a result of a mistake while shooting images for expanded depth of field processing. Being thorough: The goal is not to create some tack sharp images. The goal is to get at least one entire, coordinated series of tack sharp images with minimal change of position on the sensor. If a few are blurry and unusable, it could render the whole set useless. By remaining aware, mistakes or even possible mistakes can be recognized when they occur. Then the potentially bad image can be deleted and re-shot. Camera with manual focus and manual exposure. If your camera has a movable mirror, it’s essential that you have & use the mirror lock-up option. Apart from these details, your camera does not need to be particularly sophisticated. Focusing rail: This is essential for close up & macro. Loupe for screen is useful for outdoor work, but not essential. Hoodman brand has a good one, but expensive. Cover/cap for viewfinder unless your viewfinder is actually a tiny video display. 2. Frame your subject in the viewfinder or screen knowing that it will become larger on your sensor at the deeper focal planes than at the initial, close focal planes. This is called “blooming”. 3. Initial focus is crucial. I use a card held immediately in front of the closest point of focus. I use auto focus limited to only the center focusing point and immediately switch the lens back to manual focus. My eyes are not good enough to achieve good focus directly through the viewfinder or on the screen, even when the camera presents a magnified image. For this technique to succeed, your camera/lens combination must be exact and precise consistently. However, people with eyes better than mine can get good results obtaining initial focus entirely via manual focus. 4. Exposure: use manual exposure. Use the aperture that gives the best combination of sharp and depth of field, f/8 for most lenses. 7. Move focusing rail in equal and very small increments if you want detail in things as small as spines, hairs or pollen. It’s necessary for the areas in focus to overlap between images to get good results. The depth of focus of any one frame depends on your specific lens and its distance from the subject. However it’s not unusual to have just a couple of millimeters, perhaps 1/16 of an inch in crisp focus in any one frame. I usually use increments of 1-4 mm (1/32 – 1/8 inch). The closer the subject is to your lens, the smaller the increment needs to be. Begin at closest point of your subject and move the focal plane gradually toward the deepest part of it. Another advantage is that the smaller increments of change of focal plane between images, the better the chance that you can have a couple of flawed images that you can throw out and still have a successful composite in the end. 8. Lock the focusing rail at each new location to prevent rail sag during extension. Software: I love Helicon Focus 5.2. Its available at HeliconSoft.com. However I understand there are other good programs available. 10. ENJOY. You’ve accomplished something that was impossible up until about 10 years ago. I hope that this will be a help to someone. I welcome comments and criticism. Through my website at NaturePhotoRehab.com I assist people to transform their photos into impressive works of art that they are proud to give as gifts or to hamg them on their own wall. 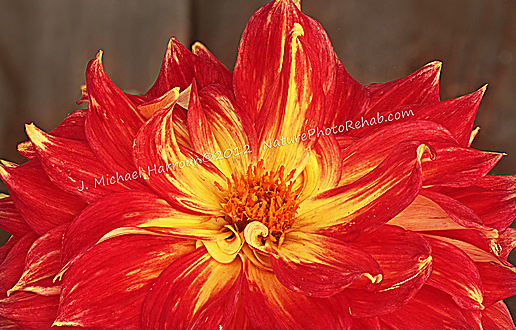 I provide photo retouching, complex processing and enhancements, prints, enlargements and framing. 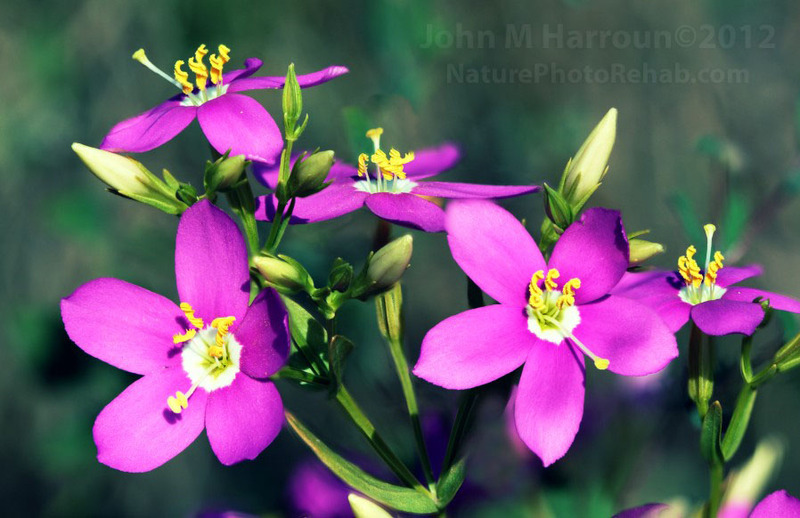 The technique of expanded depth of field, also called focus stacking, produces objects and scenes that are totally in focus from front to back. Generally in photography, single images of close objects render only a portion of the subject in focus. Sometimes this is exactly what is needed. It draws a person’s attention to that limited area. At other times, this limited depth of field of a single image is distracting and limits the amount of visual information available, compared to what is actually seen by a person at that time. Our eyes scan objects and scenes, focusing very quickly on many different areas. This gives us a perception that everything is in focus simultaneously. The technique of expanded depth of field also produces an image with the object or scene totally in focus. For this reason, the resultant composite image appears more realistic than any single image can. This also allows people to connect more fully with the subjects, to feel an emotional connection. In this way, the expanded depth of field technique can become a valuable element of photographic art. Effective photography obviously requires more than just technique. However, this is an aspect of digital photography that is superior to film, in fact , impossible with film. This is the first of a series of blog post on this expanded depth of field photography, also called focus image stacking or simply image stacking. This is a technique with which multiple, nearly identical, images are taken of the same subject. The only variable between frames is the depth of field/focus. Importantly, the depth of field must overlap between images for successful results. Then via software, the sharply focused areas of each frame are incorporated into a composite image which is entirely in focus. Although initially intimidating, this technique can be enjoyed by anyone with the proper equipment and the willingness to take their images with great care. I plan a series of blogs regarding this technique. My target audience is amateur and professional photographers who are just beginning to use this technique or who have had difficulty getting consistently good results. I am not an expert; however I have had good success producing dramatic images with this technique. On a typical day I shoot 2-4 sets of images of close up or macro subjects, usually with 35 – 45 images per set. Most of my work, and knowledge about this is close up subjects, although I do some macro work. To be exact, macro technique requires that the image on the sensor or film be at least as large as the subject itself. For example, a 1/2 inch bee would need to make an image on the sensor or film of at least ½ inch in length. If its image is smaller on the sensor, it is technically a close up image, rather than a true macro image. However, for the subjects that I will be covering, the techniques are essentially the same. My next post will be an overview/outline of this technique. It will be a “Table of Contents” for my remaining posts in this series. Hopefully I can help other people to get more satisfying results and improve my own technique simultaneously. I invite comments & suggestions.